Cinema Francophone: Masculin Féminin (1966, Jean-Luc Godard), April 25th at 5:30 p.m.
Join us for a mini-film series, en français! Wednesday evenings at 5:30 p.m., Willamette 110. All francophiles and cinephiles are welcome! April 25th: Masculin Féminin (1966, Jean-Luc Godard, France, 110 minutes). With Masculin féminin, ruthless stylist and iconoclast Jean-Luc Godard introduces the world to “the children of Marx and Coca-Cola,” through a gang of restless youths engaged in hopeless love affairs with music, revolution, and each other. French new wave icon Jean-Pierre Léaud stars as Paul, an idealistic would-be intellectual struggling to forge a relationship with the adorable pop star Madeleine (real-life yé-yé girl Chantal Goya). Through their tempestuous affair, Godard fashions a candid and wildly funny free-form examination of youth culture in throbbing 1960s Paris, mixing satire and tragedy as only Godard can. Based loosely on two short stories by 19th century French author Guy de Maupassant: “La femme de Paul” and “Le signe”. Cinema Francophone: Bienvenue à Marly-Gomon (2016, Rambaldi), April 11th at 5:30 p.m.
April 11th: Bienvenue à Marly-Gomon (2016, Rambaldi). Ayotzinapa: Chronicle of a Crime of State is the story of the forced disappearance of 43 student teachers, which exposes the criminal complicity between the police and military authorities, and the political and economic elite of Mexico. TRT 101 minutes. 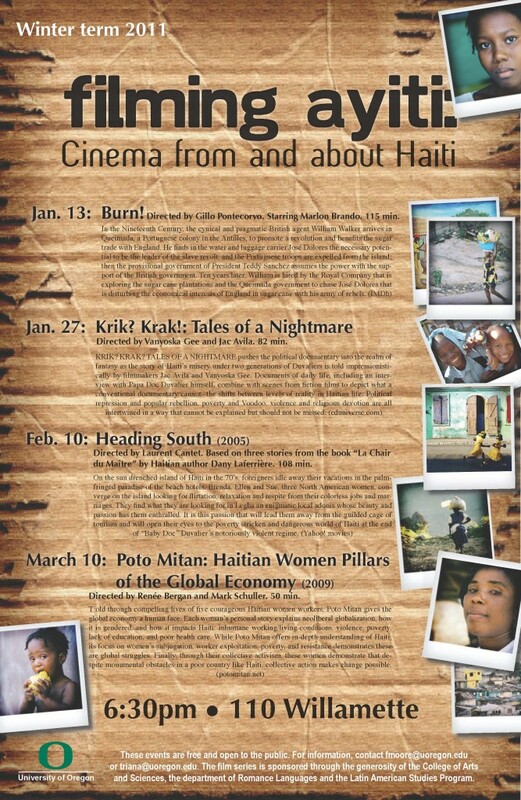 We are pleased to announce our Winter 2011 film series from and about Haiti. The series is free and open to the public. While the films are a prelude to our Spring team-taught graduate seminar on “Legacies of the Haitian Revolution” (RL623), we hope anyone interested in the people, the culture and the history of Haiti will attend. Please mark you calendars and join us to enjoy these remarkable movies and documentaries! Please take a look at the event poster for a summary of dates and titles.